Rakesh had been in the city for a while and had been Bangalored over the years. He wondered about how Bangalore had changed over the last decade. A beep on his computer drew his attention back to the code that he had been testing. He had finished his engineering and joined the herd of software engineers spending half his waking time in front of the blue screen. With the delivery coming up in a week, he had to stay back late and finish some testing. Lack of sleep and a long day were taking their toll on him and to keep himself awake he was alternating between Times News and the testing screen. Warning from the Bangalore Police Department, as seen in the local newspapers: Miscreants sometimes act as if their car has been broken down and they are seeking your help. When you stop and step out of the car, a gang appears out of nowhere and flees away with your valuables and your vehicle. It’s advisable not to stop the car for any unknown person. He saw the system time striking midnight and decided to catch-up with the rest of his work on the next day. He got into the lift and waited impatiently as it descended slowly towards the ground floor. The moment the lift doors opened, a spine-chilling gust of cold air greeted him. He came to the lobby only to realize that it was extremely cold after the heavy evening showers. His teeth were like a Morse code machine, punching the code into thin air because of the spine chilling breeze. Kittkittkitt. It was pitch dark outside. He could hear the distant growls of the zooming cars and trucks on the Ring Road. Rubbing his hands in an attempt to keep himself warm, he moved to the entrance gate. As the human count on the road became sparse, the canines started patrolling with their tails up. Dogs added the required Indianness to the office landscape. One of them looked inquisitively at him and after a moment joined its pack, which was howling together at a distance. In spite of all the atheism and rationale he was bred in all these years, he was still feeling really uncomfortable with a pack of dogs howling at a distance for no reason. It was a bad omen. He quickly got into his car and closed the doors. His vehicle came to life and he drove at full speed with everything that his beast had to offer.Heavy metal music added to the required adrenaline rush. He was driving all alone on the Ring Road with no other vehicle in sight. Then he encountered a sight which screamed DANGER! At a distance he saw a man wearing helmet running towards him, who then started frantically waving at his vehicle. He recalled incidents of robbery on the highways and stepped on the accelerator. With his palms sweating and nerves on edge, he accidentally hit the man and sent him falling to the footpath. He stopped the car and watched for any movement from the injured man. Still skeptical, he kept one foot on the accelerator. The injured man was breathing heavily and trying to hold on to the ground. Then he saw two men approaching in the rear view mirror. The gang had come. He switched off the headlights and zoomed onto the road ahead. He reached home and realized that he was trembling with fear. He was terrified and his head was spinning recounting the last 30 minutes of his life. He pictured himself being arrested, thrown out of his job and jailed, and all the bad things that would happen to him in jail. Suddenly, the “Kill Bill” whistle ringtone rang and an unknown number flashed on his mobile, interrupting his train of thoughts. He kept staring at the phone with shaky hands wondering who could be calling up so late. He didn’t have the courage to answer and it went dead. It rang again a few more times but he didn’t pick up. Later, with great difficulty, he hit the bed and slept off hoping that he would wake up and realize that all of this was just a bad dream. He was jolted out of bed with the familiar ‘Kill Bill’ whistle ringtone. Groggily, he answered the call. The brightness of the room nearly blinded him and he squinted. He jumped out of bed with shock when he heard the news on the phone. He was told that his room mate, Adarsh, had met with an accident. When Rakesh reached the hospital, he was taken to Adarsh’s bed where he noticed that Adarsh was under the influence of sedatives and was sleeping. He was numbed when the doctor told him that Adarsh was hit by a car and his legs were badly injured. It would take him a couple of months before he could start walking normally.The doctor also told that they had tried to reach Rakesh on the previous night several times as his number was marked as Adarsh’s emergency contact. Rakesh instantly understood the entire chain of events and stood there listening numb with shock.He wondered why Adarsh had been running towards the car wearing his helmet and would Adarsh know it was him. It was a genuine mistake, wasn’t it? While the war was going on in his head, he noticed Adarsh waking up. Rakesh helped him to sit and asked how he was doing and if he needed anything. He told Adarsh everything that the doctor had told about his condition. Adarsh looked devastated and started crying. He asked Adarsh to recount the events of the previous night. He told Rakesh that while riding home, his mobile slipped from his pocket and fell on the road. He parked his bike and ran towards an approaching car asking to stop, to avoid it from running over his mobile. But the driver ran over the mobile and him. He pointed towards the smashed iPhone. Rakesh asked if he saw the driver or the number plate. Adarsh said that due to the blinding headlights, he could not figure out anything. Listening to this, Rakesh was relieved for the moment. He told Adarsh to rest while he brought back some breakfast for him. Rakesh got up with a heavy feeling in his head. His heart was filled with too much guilt. He felt like a criminal. Stepping out of Adarsh’s ward, he realized that his legs were no longer supporting his frame anymore. With a heavy heart, he collapsed into a chair at the reception.Thoughts from the previous night, kept flashing before his eyes. He tried hard to shield them and divert his attention but he failed miserably. The thought of Adarsh in crutches broke him and he started sobbing. The news on the television interrupted the war inside him. A chirpy news reader was saying: Last night a member of the highway mugger gang was hit by a speeding car on the Ring-Road around midnight. The description of the victim by an eye-witness matched the records of police. The gang fled before the police reached the spot. The dream of every writer is to be read. And to be read and appreciated by as many people as possible. BWW makes that dream a reality. BWW Star is a writer who has worked with us at BWW and whose work amused, moved, inspired, and/or made a difference in our lives. We are sure you will enjoy and be encouraging too. This time we have Pradip Kumar, from the Zebras batch. His work is mostly pulp fiction with a twist. In his own words, taking the BWW course has given him more insight on how to fine tune his work. He is now using this insight to explore his unique writing style. 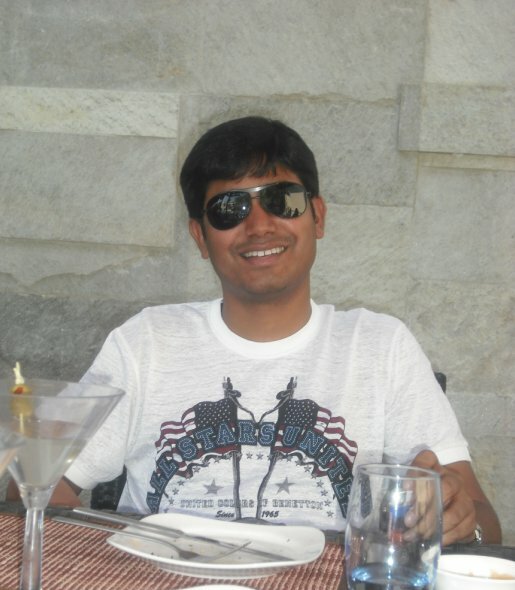 Pradip Kumar is a working professional from Bangalore. Pradip is an Engineer by profession and a free spirit at heart.His work has been published on “Readers Quotient” an online web magazine. What did you make of Pradip’s piece? Read, share and tell the author what you liked about his story! Leave us a comment. This entry was posted in BWW Star and tagged Bangalore Writers Workshop, BWW, BWW Star, Fiction, Pradip Kumar. Bookmark the permalink. excellent story. kept me engrossed till the end. well done ! !